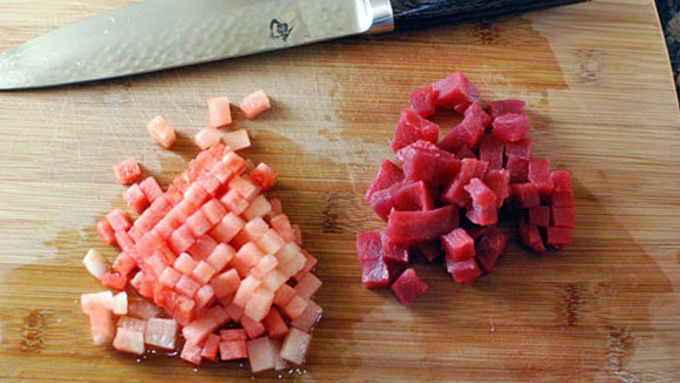 With a sharp knife, cleanly dice the tuna to match the watermelon. The rest of the veggies should be diced smaller. 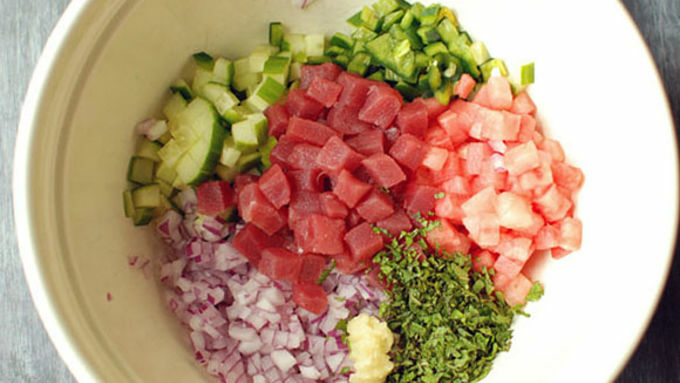 Put all the diced ingredients into a bowl and mix with the lime juice, orange juice and a few pinches of salt. Let the mixture sit in the lime juice for 15 minutes, stirring occasionally, in the fridge before serving. Serve with chips or just in a bowl. Don’t fear the ceviche. It isn’t like sushi. If eating raw fish frightens you, I understand if you don’t like sushi. 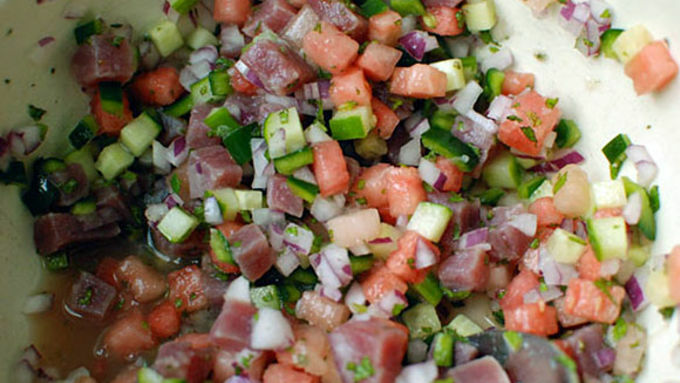 Ceviche has a taste and texture closer to that of a cooked fish. Have you heard that the lime juice “cooks” the fish and thought it was nonsense? It’s really true! The acid in the lime turns the fish from clear to opaque, and imparts a delicate to firm texture. Depending on how squeamish you are, you can let the fish sit in the lime juice for anywhere from 10 minutes to 2 hours – it will become more and more like a piece of cooked fish. 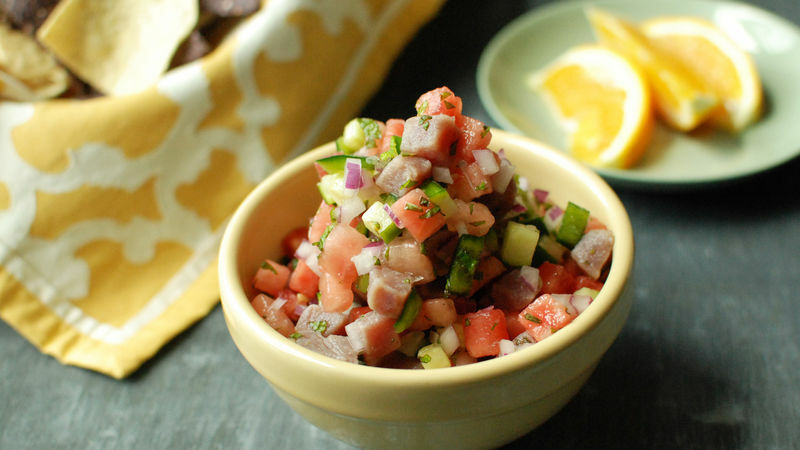 The next really hot late summer day, I implore you to try my recipe for Watermelon Tuna Ceviche for something amazingly refreshing and totally different! After only a few minutes, you’ll see the tuna starting to “cook” from the lime juice as the edges turn from bright pinkish/reddish/purple to a more grey color. If you want to keep the fish mostly raw, only let the fish marinate for about 15 minutes. And of course, the usual cautions about eating un/undercooked fish apply. 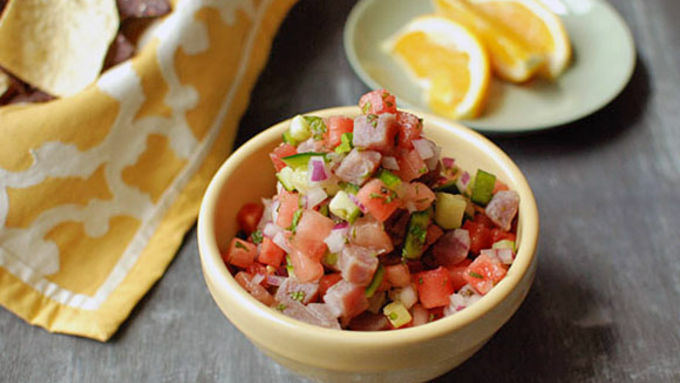 The result is a crazy refreshing ceviche that’s perfect on a hot summer afternoon!